To be honest, we are really meat and potatoes people. Or rather, poultry and potatoes people. When we first married, Ari’s idea of tuna was canned tuna and while I did like some sushi and some fish, I only ate it out of the house. On occasion. And very rarely at that. But because we are both trying to live a little healthier as we get older (never to late to start, right?!) our red meat intake has been significantly reduced and our fish intake has increased in it’s place. So, we have been experimenting with fish varieties and recipes we think will please our entire family. 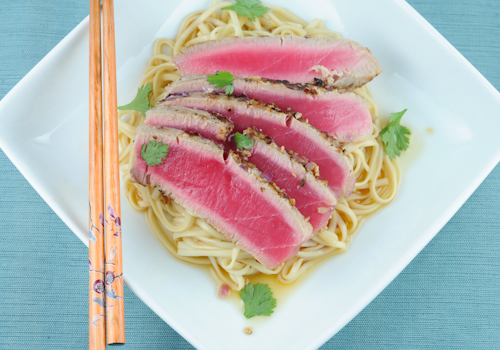 We love Udon noodles and cooking with Mirin and this Everything Tuna steak is a perfect match. Fish sticks, stand back! Rinse the tuna steaks and pat dry with a paper towel. Set aside. Set up your “batter” station by setting out two flat pans with rims. In one pan, break up the egg whites with a fork for the egg wash. In the next pan, combine the onion, garlic, seeds and salt. Because the tuna takes very little time to sear, go ahead and cook your Udon noodles per the package directions. Be sure to reserve a cup of the pasta water to add to the sauce. Add the water and noodles back to the pot and keep over a very low flame. Add the soy sauce, Mirin and rice wine vinegar. Keep warm. In a large skillet, heat the vegetable oil and sesame oil over high heat being careful not to let it smoke. Working quickly, dip the tuna into the egg wash and then the seed mixture and coat the steak completely. Place the tuna in the hot skillet to sear. About 1 minute on each side for rare tuna. 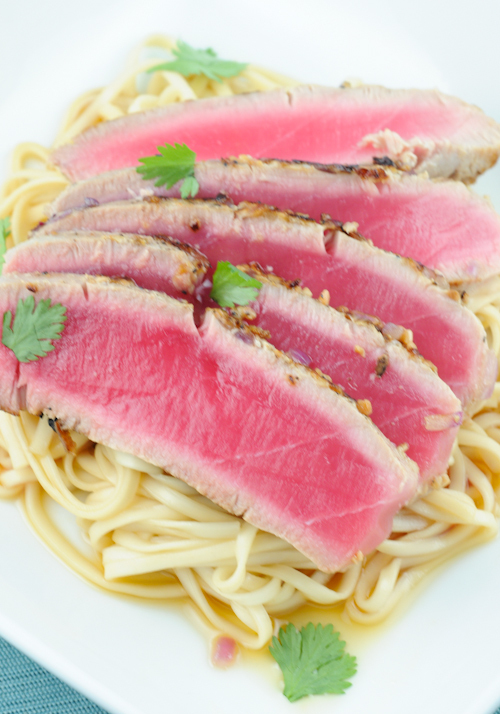 Add a portion of noodles in a large bowl with sauce and top with a tuna steak and a sprinkling of scallions. Enjoy with a glass of Rose or a crisp Riesling and you will have a lite, healthy meal. « Green Market Baking Book and Giveaway! I love rare tuna. If it was more cost effective we’d eat it it once a week. SO good. It reminds me I should really get my hands on some and these udon noodles look like a great match. My goodness that tuna looks so tasty! I don’t make fish near enough. Thank you for sharing with me tonight…I’m sorry I’ve been gone so long! Your blog continues to bring a smile to my face. I hope you have a blessed Sunday! Congratulations on the tastespotting submission/acceptance of this post.